Genesis Batman Returns (USA) in 09:30.03 by maTO. Areas include the rooftops of Gotham City, Max Shreck's department store, the Red Triangle Circus and the sewers. Besides run-and-jump action, there's also a lot of combat in the game, as many of the Penguin's henchmen stand in Batman's way. He can knock them out with punches and kicks and a number of extra weapons stored in his utility belt. These include batarangs, which come in standard and self-seeking varieties, and smoke bombs that stun enemies for a while. 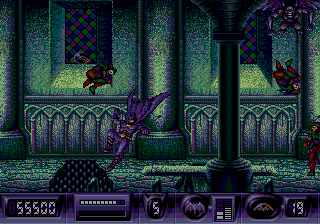 In addition, Batman can shoot from his grappling gun and unleash a deadly swarm of bats towards enemies. All of these weapons have limited ammo, however, that must be collected.